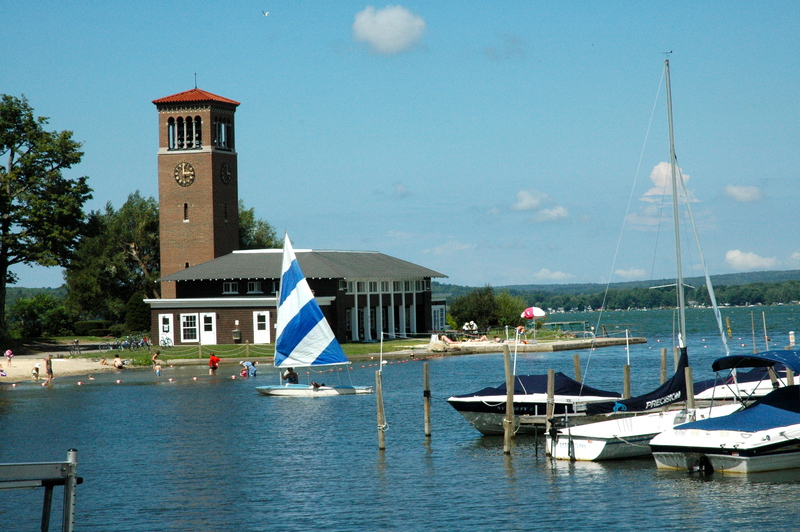 Chautauqua Institution’s iconic Bell Tower stands at the edge of Chautauqua Lake. The word means “bag tied in the middle,” which refers to the shape of the lake. On Monday, July 30, I heard a fabulous lecture about technology and how it defines our relationships. Sherry Turkle, an MIT professor, spoke about being “Alone Together” at Chautauqua Institution, New York. I wrote down some key points to share, since as bloggers, writers and readers, technology shapes our creative lives as well as our everyday lives. The byproduct of being able to communicate by texting, Sherry explained, is a fear or an inability to have a regular conversation. She shared a great comment by a college student who wants to someday–someday–learn how to have a conversation (but not now). She also discussed the “I share therefore I am” phenomenon that has sprung up due to Facebook, Twitter and other social media sites. I feel that pressure sometimes in the blogging world. If I don’t get a post up on Monday morning, for instance, or if I don’t reply to comments right away, I feel uneasy. One of her suggestions for parents is to set three media-free zones–the kitchen, the dining room and the car. “I’m interested in getting people back to conversation,” she said. We must redevelop our capacity for solitude–something that writers must have to write, which is one of the reasons I’m sharing her thoughts today. (Blogging and tweeting and Facebooking and emailing all erode that quality quiet time so quickly, don’t they?) Solitude, and being able to be alone with yourself, enables conversation. “Start thinking about solitude as a good thing,” she said. As I was working on this post, sitting on my porch in Chautauqua in early August, two women stopped on the street below me. One began telling the other about Sherry Turkle’s message. It was a perfect example of conversation in the real world, exchanging ideas and being present in the moment with someone else, and it made me smile to be sitting above them, mulling over the same material. The woman talking about the lecture pointed out that many audience members were taking notes on an iPad, and that Sherry gave everyone her Twitter hashtag. I might have been able to finish this post if I had been taking notes on an iPad. Instead, I was using a pen and the back of my knitting pattern, and I left my knitting on the plane when flying back to Oregon. I’ve been hoping, for the past few weeks, that I’d get an email from the airline saying my luggage had been found, so I could finish this post and write one on the presentation by Dahlia Litwick, senior editor at Slate. Unfortunately, it seems like my half-finished shawl project–and my notes on several morning lectures–are gone. At least you can find the Chautauquan Daily article about Sherry Turkle’s lecture online. Be sure to check out the Q and A section, when she addresses whether texting has changed our writing. Do you prefer to text, not talk? How much of your daily communication is technology driven? This entry was posted in Technology, Writing and tagged Alone Together, Chautauqua, digital identity, Sherry Turkle, text not talk. Bookmark the permalink. Laura, how timely this post is for our daily “dose” of blog,tweet, Facebook stuff. Personally, I have always cherished my solitude. It is the major reason I love talking to people, engage, watch and enjoy people in all walks of life. My solitude gives me the perspective and the time I need to “fill” up again, refreshed and ready to engage in what I love. I feel the same way about solitude, Florence. Without it, I feel empty. Your blog, and your commenting style, definitely reflect your interest in conversation. Even though those two things are technology oriented, and without facial expressions, you address your readers and respond to other people’s posts in a way that invites dialogue. I have never joined Facebook, but I expect it is great for seeing photos, hearing about (or organizing) events and keeping in touch with occasional friends. I do love to pick up the phone and talk to faraway friends, rather than trying to touch base by email, and I only use texting for setting up playdates or telling someone I’ll be late. Great post. Most of my work is carried out by email and I often have a conversation with my friends via text messaging rather than phonecalls. But when we do meet up, we’re usually pretty good and won’t use our cell phones while we’re in company. That would be a great rule to add to Sherry’s list of no-media zones–no phones while hanging out with your friends. I hate going to a fun event, excited to see everyone, and then listening to everyone talk about something on Facebook. That has happened less in the past year, but it has happened to me quite a bit, and since I’m not on FB, I feel left out, but, more to the point, I feel like getting together should encourage conversation, not be a rehashing of something that happened online. I guess I’m neither pro nor anti technology, at least not absolutely. I almost never text, and I dislike talking on the phone. I rely on email whenever possible (as opposed to using the phone). I’ve never been on Twitter, and I’m sick of Facebook. I do blog regularly (once a week), but I think I missed last week and I’m cool with that. I do try to respond pretty promptly to blog comments — that’s just being polite. I am a sucker for face-to-face conversations, which is probably reflected in my writing. My characters have no computers, almost no telephones (and landline only), and a rather eccentric postal service. There are a lot of great things about technology, and how it encourages us to connect and communicate. Skype is one of the tech tools that encourages conversation, I think, and certainly cell phones are often used for real conversations, not just texting. I used to write tons of long, letter-like emails but have had less time over the past two years to give email that kind of attention. I love the timelessness (out-of-time-ness?) of your writing, Anthony, in part due to not throwing in computers and cell phones. A guy in my writing group did something similar with his work–no technology, no cars, no nothing but their houses and gardens and lives. The choice made for a rich story-world. That’s a great technique you use to make U-town come alive. I love this. I spend a fair bit of time online (reading blogs, writing blog posts, keeping up with FB) but I also spend a lot of time reading, or in solitude, or spending time with my kids, husband and friends. I went for months earlier this year without being online, and it was a remarkably freeing experience. I also totally agree with the parenting parts of this! I have often thought about your blogging hiatus, Jo. It’s so easy to get lost in the flow of information, giving and receiving, and the more posts and comments you write, the more there are to follow up on. I imagine stepping out of that circuit gave your brain a nice break. I have a dumb phone too–love the phrase! I text my mom friends similar messages–Walk in 5? Running late. Leaving now! It’s amazing to think our kids are going to grow up in this tech-centric world. I am really enjoying Lauren Kessler’s “My Teenage Werewolf,” where she studies her own 12-turning-13-year-old daughter for a year and a half, including going online and exploring the virtual worlds she visits. Really eye opening, scary stuff–but her daughter makes the right decisions. She points out that our kids’ brains are (or will be) totally attuned to the online world, and when her daughter goes online, it’s another part of reality for her. Technology and social media have their places, but we do seem to be losing the real connections between smaller groups of people. I love blogging and seeing readers coming from all over the globe. But I also enjoy good conversations with family and friends. I don’t tweet, and Facebook is only for keeping up with real family and friends scattered across the country. Can we add restaurants to the no-media zones? No restaurants, I agree! Good plan, jm. Now can we get everyone to follow it? What I love about blogging is the conversation, and as you point out, how the medium spans continents and can bring people with similar interests together. I really can’t stand texting. I could be showing my age. I was at a restaurant with my husband and kids and at the table next to us, a father and his teen daughter were texting on their own phones–completely ignoring each other. I was really disgusted. Here you are, you have an opportunity to engage with a live person (your family member, no less) and you opt to text someone else? Families are in enough trouble as it is (particularly parents and their teens). Why do we choose to make it worse? As far as blogging, I pretty much only blog with people who enjoy jib-jabbing about writing. I don’t have friends or family who are writers or who even understand what it’s like to be a writer. So, I consider blogging to be my time to vent and share with like-minded people who ‘get’ what I’m talking about. Thanks for the link to the article. I’ll definitely check it out! The dad and daughter you talk about could have been an example in Sherry Turkle’s talk. She reeled off example after example of that kind of thing. When I was having my baby, one of the nurses said something about how most of the new parents forget about the baby and instead of gazing adoringly at the minutes-old life, get busy texting photos and messages to friends and family. Shocking–but I can totally see that happening. Blogging, the way you use it and the way I use it, is about community and writing community in particular. I love that. Excellent, thought-provoking. Well done, and well said. Thanks, Naomi! I’ve thought so much about Sherry’s talk since this summer. For one thing, I’m very aware of the instinct to pick up the cell phone and call someone when I’m alone. Half the time–or more–I put my phone back and just enjoy the silence and my own company. If I really have someone I want to talk to, I reach out and connect. But I’m no longer doing it out of habit or feeling like I SHOULD be connected, if that makes sense.